Anaheim is known for its great attractions and wonderful weather, two of the many reasons people love to call Anaheim home. The Southern Californian residents are fortunate enough to have warm weather for the majority of the year, allowing them to do whatever they want to do whenever they want to do it! But imagine having a great day full of fun at Disneyland and coming home to a busted pipe in your home? That would be sure to ruin anybody’s fun! Today we are going to discuss all things Plumbing 101, from routine maintenance to 24-hour plumbing repairs, we will break down the ins and outs of everything you may need to know! So when something pops up, you have the right tools to get the job fixed quickly. Plumbing revolves around three basic things: gravity, pressure, and water seeking its own level. Knowing that these are the main three factors causing issues in your home can help you save money, time and frustration! Homes are fitted with two main systems, one for bringing fresh water into the home and one for removing waste. The water traveling into your home is always pressurized so it can travel where it is needed! Upstairs, in the backyard, in the basement, and even in your kitchen, water travels quickly via water pressure. In a plumbing emergency, it is crucial to understand where your main shut off is. This will allow you to shut off all water going into your home in a quick manner. In a matter of seconds, your home can become flooded if a main pipe breaks and you can prevent any further damage by understanding how to turn it off quickly! The drainage system or waste system runs on a whole different set of principles. Instead of using pressure to move around the waste, this system uses gravity! The drainage pipes all pitch, or angle, downward. Gravity pulls the waste along. The sewer line continues this downward flow to a sewage treatment facility or a septic tank. Your sinks in your household are put through more issues than most people go through in their entire life. Endless amounts of hair, saliva, shaving cream, makeup, you name it, are put down the bathroom sinks on a daily basis. Every once in a while, you can get a clog that holds up any sort of drainage. Most people first tend to think it may be time to buy some Draino! But this is not the first solution to the problem. There is a much cheaper way to get the job done…. Try removing the trap and clearing any contents that may lie inside. This is usually the first step to take because you will be able to solve the issue very quickly! Draino is costly and does not always work. If it is a toilet that is clogged, first try using a plunger and see if you can get rid of the blockage. Sometimes professionals are needed to fix toilet clogs but for the most part, a simple plunging should fix the issue! Sometimes your sinks and faucets begin to leak. This can be caused by a number of things, but the solution is usually somewhat simple. First, try tightening any loose nuts or bolts that may be causing the leak. Sometimes a water line will be loose underneath the sink which can cause issues. It is a great idea to periodically check under your sinks because any unattended leaks can cause huge issues in the long term! Sometimes a leaking sink or faucet is something that cannot be explained other than the sink or faucet is old and needs replacing. One of the most annoying things to deal with as a homeowner or tenant is a busted garbage disposal! It makes irritating noises when broken and is somewhat scary to fix with the blade of unknown down in the dark hole. There are a few steps that are needed to be taken to assure a safe fix! First, press the reset button on the bottom of the garbage disposal, located underneath your kitchen sink. If you hear a noise but then quickly turns off, it is likely an obstruction. If you don’t hear anything, the unit itself may be broken. When something is blocking the garbage disposal it is smart to make sure you unplug the unit from the wall before sticking your hand down the sink. Check to see if any debris may be causing the blades from spinning. Sometimes glass gets broken down there causing big issues so make sure to be careful when feeling around. If you do not find anything in the sink, the next step would be to manually crank the garbage disposal. There usually is a spot to turn with an Allen wrench. Keep turning until the unit seems to be spinning with ease. This is usually what fixes the issue! If not, you may need to reach out to a local expert. Water is one of the most damaging element that there is on this planet. In just the matter of minutes, your entire home can be flooded and ruined if a main pipe bursts. The key to maintaining a safe home is to continue to take preventative action with your pipes. When an emergency occurs in someone’s plumbing line, everything in its path is usually ruined, costing many dollars and many hours of clean up. There are two main things that we recommend you do on a monthly basis. One, check your water pressure. Low water pressure is very uncommon and usually not damaging, but high water pressure can ruin homes. Most state plumbing codes call for the pressure to be below 80 psi, but sometimes things can go wrong! This is why you should regularly check the pressure. High pressure can destroy anything in its path. The second tip is to visually inspect your plumbing. You will often see signs of wear or tear on your pipes well before they burst, so catch the issue early! 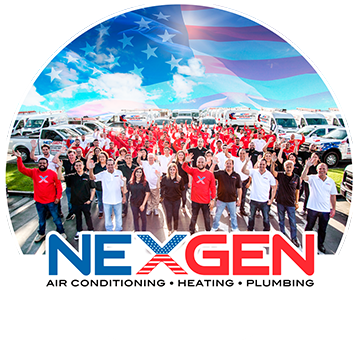 When in doubt, you can always reach out to Nexgen for more advice and for a full evaluation.